A flying wedge (flying V or Wedge) is a configuration created from a body moving forward in a triangular formation. This V-shaped arrangement began as a successful military strategy in ancient times when infantry units would move forward in wedge formations (sometimes called the "boar's head") to smash through an enemy's lines. This principle was later used by Medieval armies in Europe, as well modern armed forces that have adapted the V-shaped wedge for armored assault. The wedge was an aggressive formation used to 'crack open' enemy lines. Relatively small groups of legionaries could form such a triangle and then drive their way into the enemy ranks. As more Roman soldiers reinforced the wedge from behind, the enemy line could be forced apart. 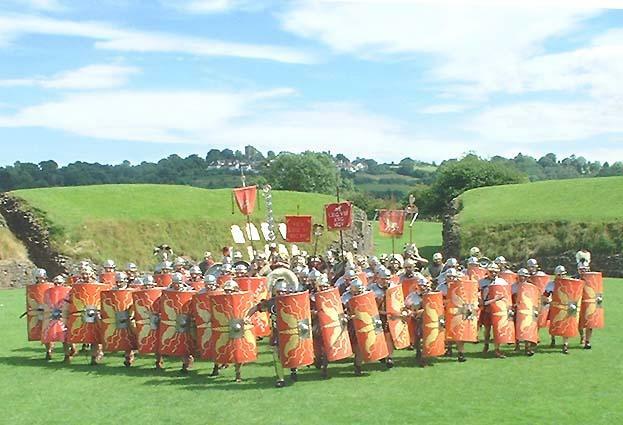 As breaking the enemy's formation was very often the key to winning a battle, the wedge formation was vitally important battlefield tactic of the Roman army. In modern times the effectiveness of flying wedge means it is still employed by civilian police services for riot control. It has also been used in some sports, although the use of wedges is banned due to the danger it poses to defenders.